Description: This work provides an in-depth investigation of after-the-fact predictions in ancient Near Eastern texts from roughly 1200 B.C.E.�70 C.E. It argues that the Akkadian, Aramaic, Hebrew, and Greek works discussed are all part of a developing scribal discourse of �mantic historiography� by which scribes blend their local traditions of history writing and predictive texts to produce a new mode of historiographic expression. This in turn calls into question the use and usefulness of traditional literary categories such as �apocalypse� to analyze such works. Citation: Gerhard Karner, review of Matthew Neujahr, Predicting the Past in the Ancient Near East: Mantic Historiography in Ancient Mesopotamia, Judah, and the Mediterranean World, Review of Biblical Literature [http://www.bookreviews.org] (2013). 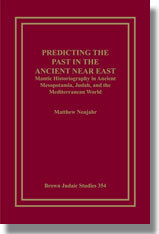 Citation: Lena-Sofia Tiemeyer, review of Matthew Neujahr, Predicting the Past in the Ancient Near East: Mantic Historiography in Ancient Mesopotamia, Judah, and the Mediterranean World, Review of Biblical Literature [http://www.bookreviews.org] (2014).